When it comes to meal planning, I am all about protein. I had bariatric surgery nearly 6 months ago, and all my meals and snacks are supposed to be “protein forward.” As long as I end up with 70ish grams of protein at the end of the day I’m golden. More specifically, a high-protein post-op diet helps you lose fat while holding onto muscle, and I have been doing a bang-up job. But when you physically can’t eat a whole lot, it can be difficult to pack in the protein, and endless protein shakes and bars get old really quickly. So when the urge to bake struck, I knew whatever I made had to have a decent dose of protein — and taste good. Since I keep a bag of frozen bananas at the ready for smoothies, I thawed out a couple of them and made these Banana Bread Gingersnap Protein Muffins. They’re slightly sweet thanks to the lower glycemic coconut sugar and have a little extra heat and crunch from crystallized ginger and chopped walnuts. The bananas, applesauce and Greek yogurt make for a really moist muffin, and each serving will get you around 9 grams of protein, which is pretty solid for a baked good. I used a six-”cakelette” mini bundt pan, which holds basically the same contents as a standard 12-muffin tin. Preheat oven to 375 degrees. Spray a muffin tin with nonstick spray. In a large bowl, stir together the wet ingredients, then add the rest of the dry ingredients and stir until just combined. Pour batter into prepared tin and bake 25-30 minutes or until a toothpick inserted in a muffin comes out clean and the muffins are slightly golden. 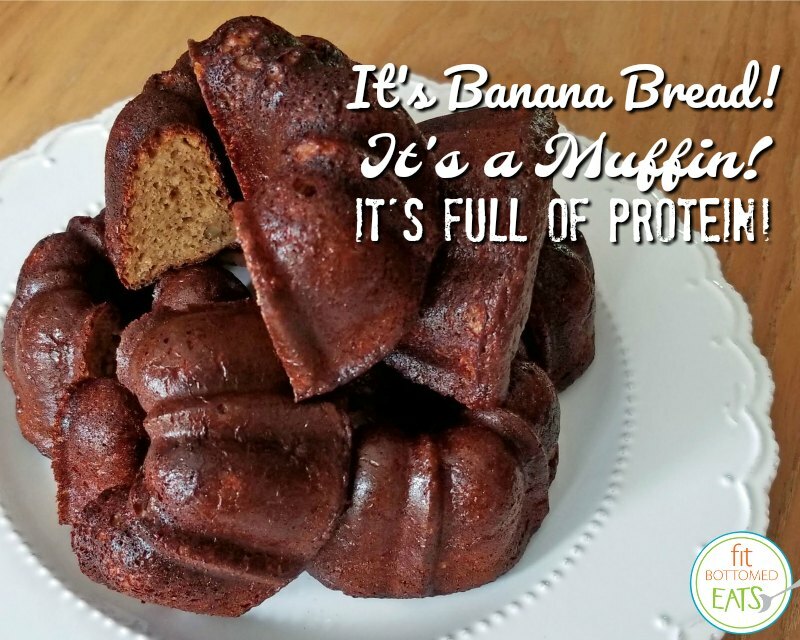 Substitute for the Greek yogurt in the banana bread ginger snap protein muffin? Can’t do the dairy. Thanks for this recipe! I’ve made this twice now, and I love it – it’s a new staple for me! so much YES in this post! I LOVE to bake and share it and it is DEFINITELY how I show my love. Banana bread and muffins are two of my favorite things to make and share. Honestly i LOVE to bake and I think I like to share it even more than I enjoy eating it! ha! – This banana bread looks heavenly. tomorrow only I'm gonna try it out!